IT'S the seventh anniversary of MSNBC's "Hardball," but the show's leap-out-of-the-chair host, Chris Matthews, seems uncharacteristically subdued and reflective. "It's a very biblical number, seven," said Matthews, whose knock-'em-off-track questions have swept the carpet out from under hundreds of politicians and an army of Washington insiders. "I've always just assumed this show would last forever." The show celebrates 1,565 shows this week, each one jam-packed with smiling-but-steamed pundits and politicians who've sparred with Matthews nightly since 1997. And it's on a ratings high, too. More viewers have been watching Matthews than CNN rival Anderson Cooper for the last month. Meanwhile, the assertion "let me finish" has been uttered by guests 132 times in seven years, according to producers. "I just think that the show is a way of getting to the truth," said Matthews. "To use a Yiddish phrase, I'm a tummler [one who makes a racket]," said the Holy Cross College graduate, the highly regarded religious school in Worchester, Mass. "My job is to go to the mountains when it's raining, go into the room with the old ladies and shake 'em up," he said. "Engage the witnesses, engage the guests, get them involved, talk to them in ways so that they're surprised at the question you ask them." 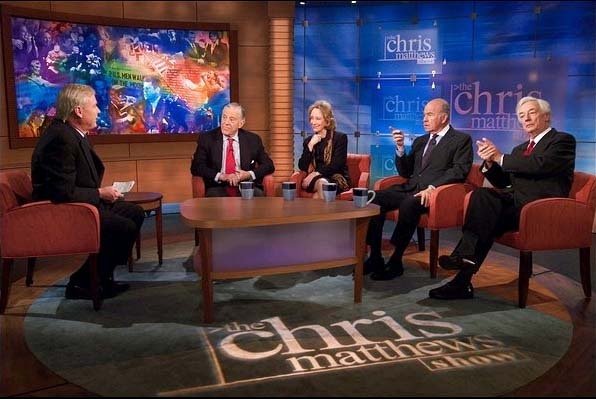 With 482,000 viewers each night, Matthews is also one of the most successful shows on MSNBC, while his syndicated weekly public-affairs program, "The Chris Matthews Show," continues to grow. His crouching-tiger style of interviewing - during heated exchanges with guests he seems ready to fling himself out of his chair and into viewers' laps - has been parodied 12 times so far on "Saturday Night Live" by Darrell Hammond.